Look at me shopping for deals! It is true that having a baby is expensive, especially when there are such cute cool items on the market. Seems like they all are must haves sometimes. But the past month I made sure to think twice when purchasing baby items. Not only was it getting expensive, our house was turning into a baby play ground ha! Now I ask questions like, do we really need it? Is it something I really want? How long will it be used for? And can I get it for a deal!? Well this has been working great for me so far! Some items I think I want, turn out to be things that would be a waste of money and other things, great buys because I thought it through enough. Last week I wanted 2 Fischer price 3 in 1 baby chairs, one for us and one for the inlaws. I found a seller on kijiji in my area and she had twins and was selling both! They were in perfect condition and I bought them for $25 each! In the store $80 each. When I joined stroller fitness I used my current stroller, my Peg Perego Skate that my sister and SIL bought me as our baby gift. I love this stroller but in the park it wasn't that great and it was getting pretty beat up too on the rocky paths . So I decided to look for used stroller that would be better for all terrain. I emailed sooo many sellers on kijiji and bargained. 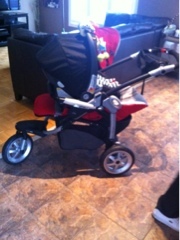 I ended up getting the Peg Perego gt3! For an amazing price! 70% off the original price. 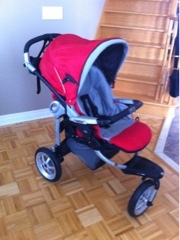 It was used for only a year and the stroller is in mint condition. It also allows me to snap in the infant carrier. Although baby K will be outgrowing that soon! But it's great to have! So that's 2 weekends in a row of shopping for deals. Go me!